Egypt’s tourism receipts were down 15 percent in 2015 compared with the previous year as a falling Russian rouble and escalating terrorist attacks took their toll on the sector, the country's tourism ministry announced on Tuesday. Egypt saw $6.1 billion in tourism revenue last year, as the total number of tourists dropped by 6 percent to 9.3 million and the total number of tourist nights declined by 14 percent. The sector suffered a number of setbacks in 2015, including several terrorist attacks by Sinai-based militants affiliated with ISIS, culminating in the downing of a Russian airliner travelling from the popular Red Sea resort of Sharm El-Sheikh in October, which claimed 224 lives. The plane crash was claimed by local ISIS affiliates; Russia has said that terrorism was the cause of the incident, while the official investigation led by Egypt has yet to publish its findings. The incident prompted the UK, Russia and others to suspend flights to Egypt, leading to losses of LE2.2 billion ($283 million) a month according to the ministry’s statement, as tourist numbers and revenues halved in November and December. A falling Russian rouble also caused revenues to decline by 20 percent in January and February of 2015 compared with the previous year, said the ministry. Egypt’s Red Sea beach resorts are a popular destination among Russian holidaymakers, who made up close to a third of the 9.9 million tourists who visited Egypt in 2014. But in recent months dozens of hotels have been forced to shut their doors in the resort towns of Sharm El-Sheikh and Hurghada, where occupancy rates have fallen to as low as 10 and 15 percent, Elhamy El-Zayat, chairman of Egypt's Federation of Tourism Chambers (EFTC), told Ahram Online in a telephone interview. 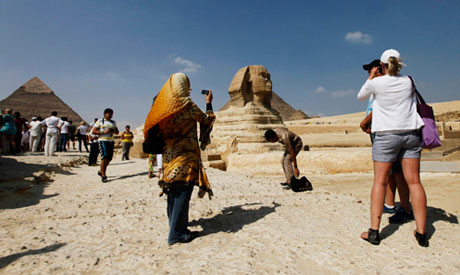 Egypt’s manpower ministry announced on Tuesday that it had signed off on LE10 million ($1.3 million) in subsidies to 14,000 workers employed in 126 touristic establishments who had stopped receiving their pay in light of the crisis, in addition to LE23 million ($2.9 million) already distributed to 32,000 workers since the beginning of the year, Aswat Masriya reported. Tourism is an important source of foreign currency revenue for Egypt, which has been seeking billions in foreign financing facilities to address a severe hard currency shortage and to maintain FX reserves at $16.4 billion over the past three months. In 2010, around 14.7 million tourists visited Egypt, generating $12.5 billion in revenues. Never once has Sisi taken the leadership to talk to the Egyptian people about the decline of the LARGEST segment of the Egyptian economy, and how he is planning on reversing this decline. He's been making all sorts of useless speeches about secondary issues of no value to the Egyptian economy or democracy. It's time for a NEW LEADER who understands the economy and has the guts to level with the Egyptian people.